RopeLab’s Richard Delaney will be running a cutting-edge workshop at our Sydney facility on 13-14 May 2017 on the topic of powered winches in technical roping disciplines. This is an area of considerable interest to many tech’s, and you’ll be learning from one of the best. Places are limited, and quite inexpensive so ensure you book your seat without delay. 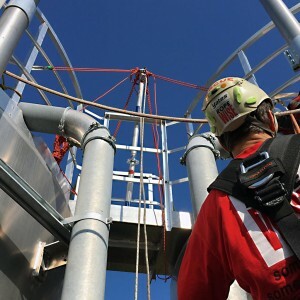 This 2 day workshop has been designed for rope access technicians, riggers and rescue operators who are using tripods and powered winches on their worksites to move people and other loads. Increase students’ understanding of the legal and safety issues around the use of tripods and powered winches to move loads. Increase students’ knowledge of appropriate rope based systems to move loads using tripods and powered winches. Australian qualifications and regulations that apply to rope access and mechanical lifting. Tripods, gin poles and other artificial high directionals. Equipment ratings: MBS and SWL of rope based systems. Tension load cells: monitoring system loads. Richard is offering a dscount to existing RopeLab Members. Raymond was a very engaging trainer, extremely across the topic and an all round great bloke. The course and facility was of a high quality but Raymond definitely made it stand out as the best course I have done. I would highly recommend Pinnacle to anyone as a result and will make sure that my company considers Pinnacle first for any future training.